Our volunteer librarian, Jenny, travels every year to help us with our school library programme. She has helped us open over 100 libraries in Eastern Uganda. 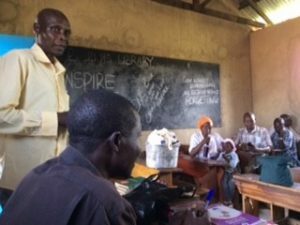 This summer she visited these libraries to see how schools were fairing and to train teachers and librarians on how to make the best use of the books they have. Bwiri primary school is in Manafwa district more than one hour’s drive from Mbale and close to the Kenyan border. It received an AET library in June 2014. 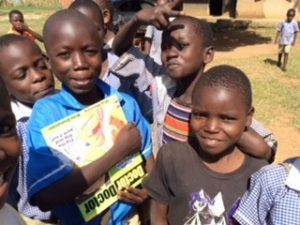 The school was chosen because Fred Buketi had been moved to this school leaving behind an extremely successful library in his previous school. His excellent librarian work has continued. The school commissioned appropriate shelves and a suitable room was chosen. Staff helped with the initial set up, labelling books and arranging placement on shelves under Fred’s leadership. He gave his own staff training. The distance of the school from town and the difficulty of poor roads made worse during the rainy season meant that the school was not revisited until this July 2017. Three years is a long time to maintain a quality library without support but Fed had more than achieved this. The library had switched room to one with better natural light. Library signage, which had fallen from the walls, had been hung on a metal coat hanger from the beams. This is an ingenious idea, which AET will adopt in other schools. The shelves appeared thin in their quantity of books. Were they lost? No! In the last months, Fred has been lending books at a rate of more than 200 per month. The lending record spoke for itself. Teachers were eager to tell us about using books in class. A whole school assembly was called to celebrate the library and children all raised their hands when asked if they borrowed books and if their teachers had read stories to them. The cheers were resounding. A staff meeting was called at lunchtime to thank AET for the original books and for the extra boxes now supplied. Many people talked about how the library has raised the profile of the school so that numbers have grown and the school population has reached 839 from in the 600s. Fred himself is married with a young family. He is proud to have been chosen as an AET Lead Librarian and regularly attend courses and meeting to learn more. He is supporting two other nearby schools and gives regular feedback on their progress as well as on other issues in Manafwa schools. He is a highly valued member of the Uganda team, working hard for no remuneration.